James has long had an interest in the famous Dutch graphics artist Maurits Cornelis Escher, whose work features mathematical objects and optical illusions. As a teenager he had a poster of Escher’s Dragon on his wall and as an adult very much enjoyed reading Douglas Hofstadter’s Godel, Escher, Bach that explores the common themes between the works of the mathematician, the artist and the composer. 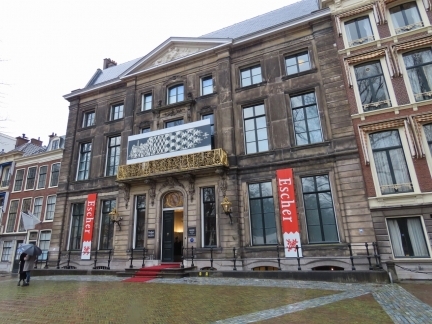 Naturally, the Escher in the Palace exhibit was high on our list for a visit to The Hague. We also walked through 13th-century Binnenhof, the seat of the Dutch parliament and the oldest functioning House of Parliament in the world, and enjoyed the city’s architecture, old and new. The 361.22ft (110m) superyacht Jubilee was departing Amsterdam as we walked to the train station. 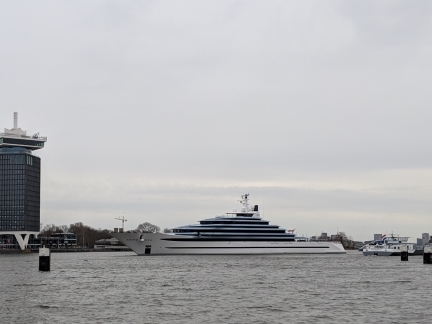 Jubilee was the largest boat ever built in the Netherlands when delivered in 2017. 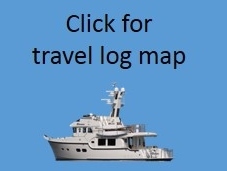 The ship is equipped with two 4,828hp MTU diesel engines and has a top speed of 18.5 knots. 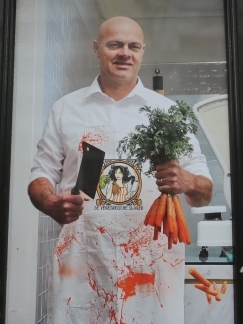 That’ll be just over 450 gallons (1700L) per hour. 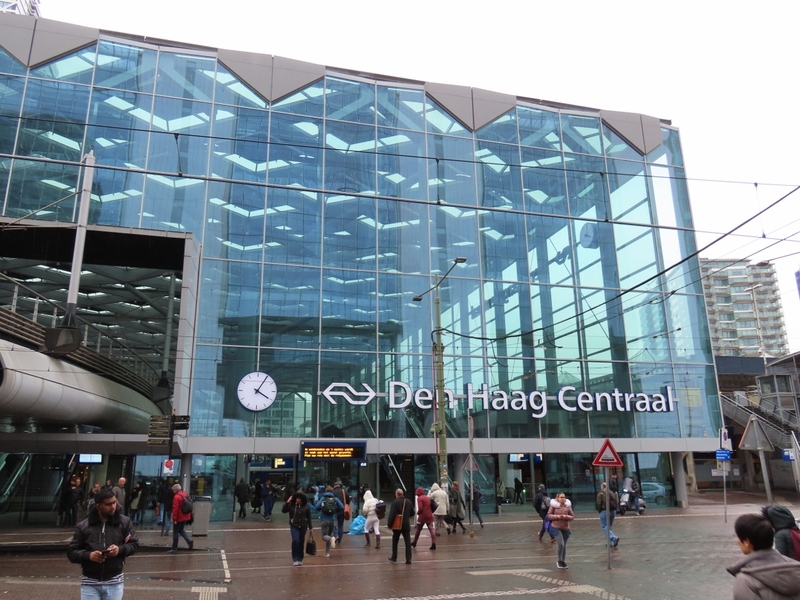 We alighted in The Hague 50 minutes after our train departed Amsterdam station. We’re loving the ease of train travel from Amsterdam. 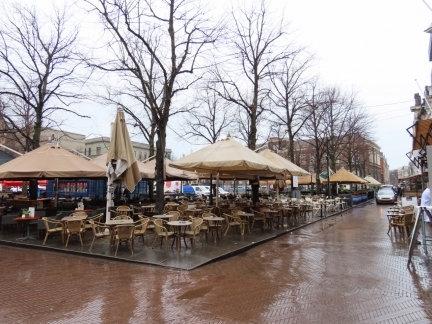 The historic Plein (Dutch for “Square”) in The Hague is ringed with restaurants and bars. 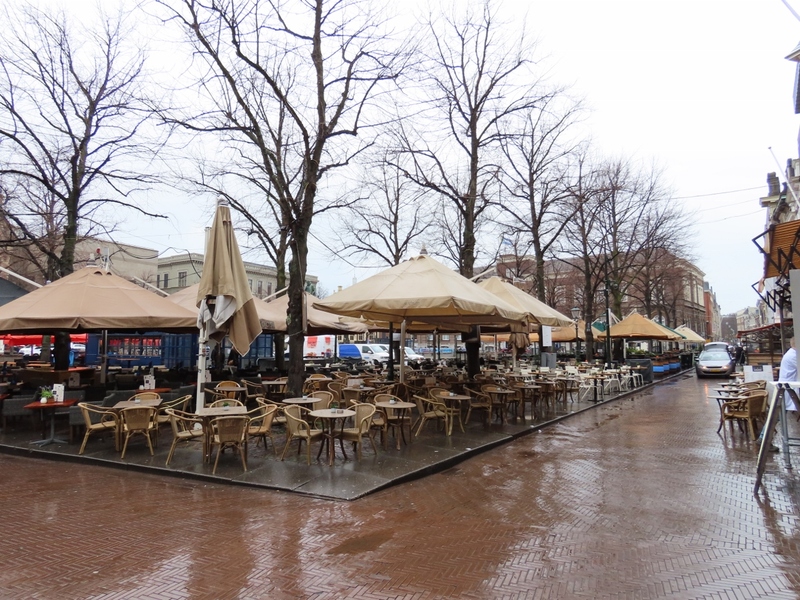 Despite the cold and soggy weather, when we returned a couple of hours later for lunch many of the heated outdoor patios were packed. We opted for lunch inside, but in the late afternoon had a drink outside under a heater before returning to Amsterdam. 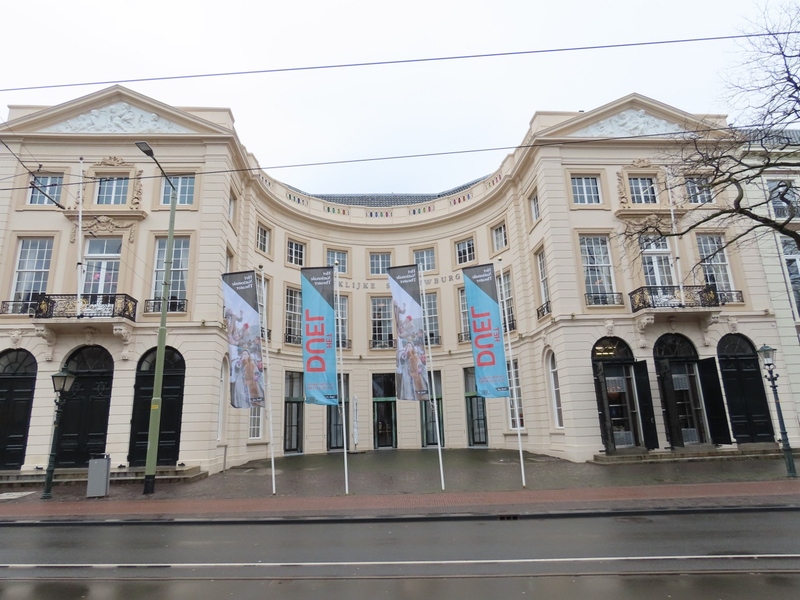 The Mauritshuis museum in The Hague contains a collection of Dutch and Flemish masterpieces, including Vermeer’s Girl with a Pearl Earing. 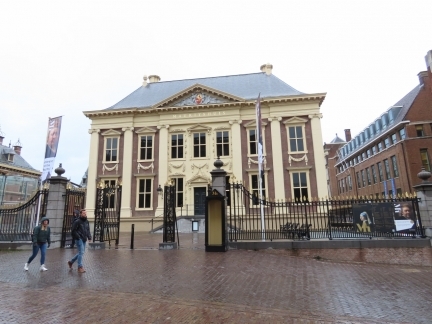 The building was completed in 1640 as a mansion, and housed the royal collection starting in 1822. 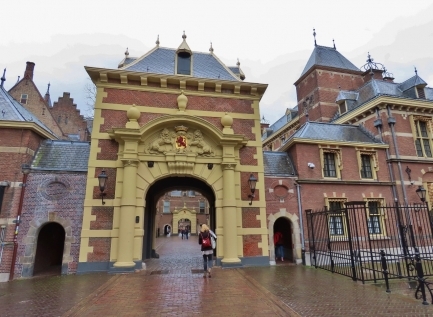 The ornate east gate at Binnenhof, home of the Dutch Parliament. 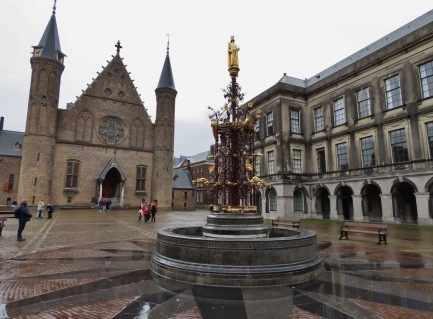 Built mostly in the 13th century, Binnenhof is the oldest functioning House of Parliament in the world. 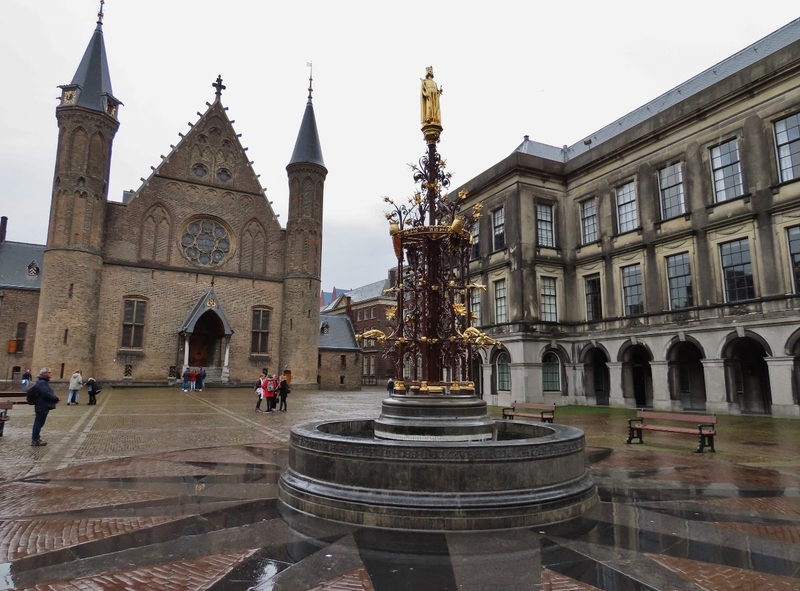 Gilded fountain topped with a statue of King Willem II in the Binnenhof courtyard. 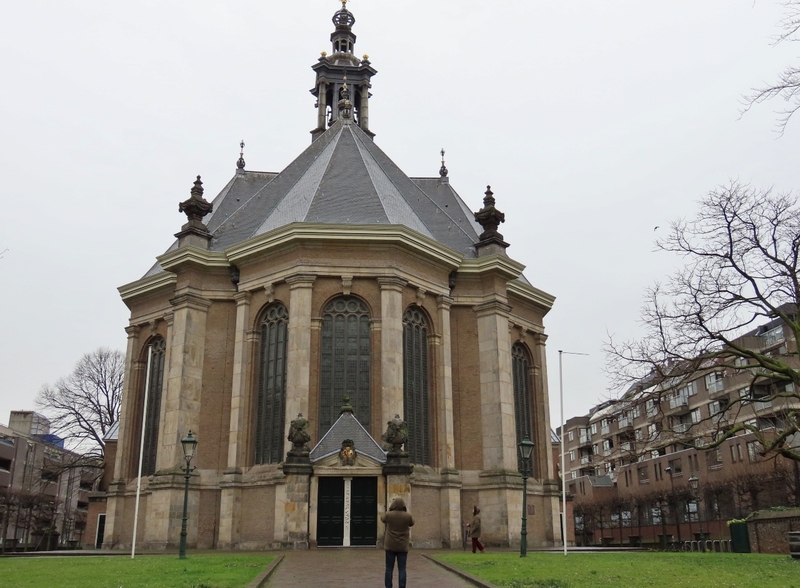 Behind is the Gothic Ridderzaal (“Hall of Knights”), where visiting knights were sheltered. 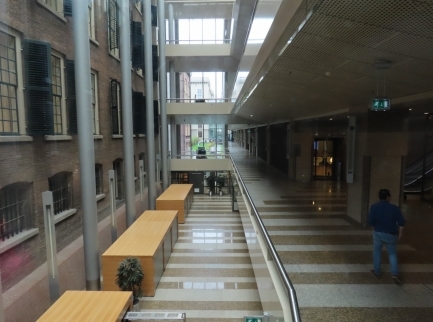 The glass-covered walkway Statenpassage in the modern home of the House of Representatives runs along the south side of the historic buildings. 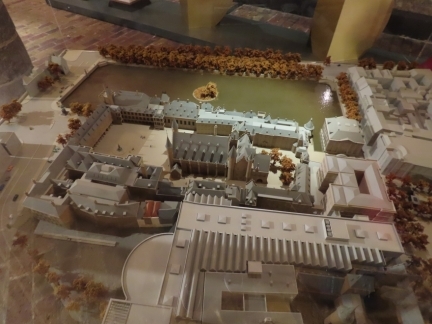 A model of Binnenhof in the visitor’s center. 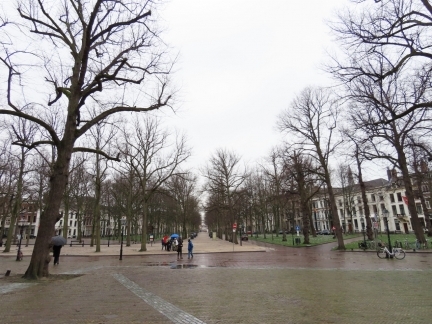 The Plein is partly visible at bottom right, Mauritshuis museum is at top right, Ridderzaal is in the center of the courtyard and the King Willem II fountain at the left. The modern home of the House of Representatives is the large building at the bottom. 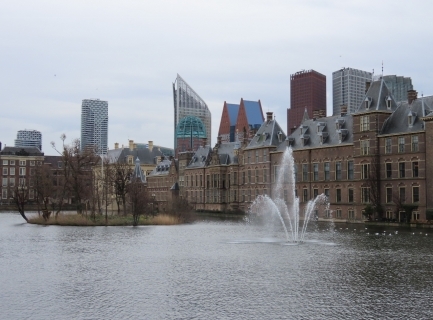 Looking southeast to Binnenhof across the lake Hofvijver (“Court Pond”) with the modern buildings of The Hague in the background. 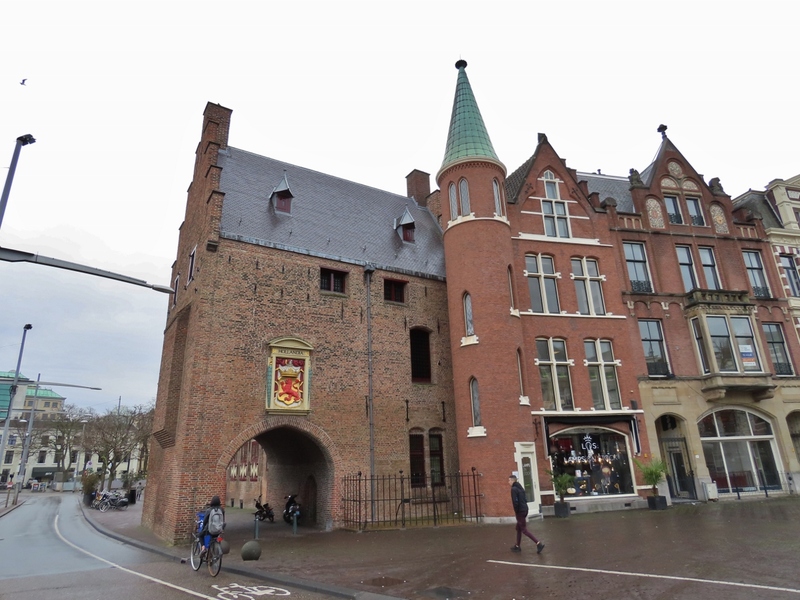 The Gevangenpoort (“Prison Gate”) once was the entrance gate to the castle of the Counts of Holland. Late it served as a prison for those awaiting punishment and now is a museum documenting crime and punishment across the centuries. 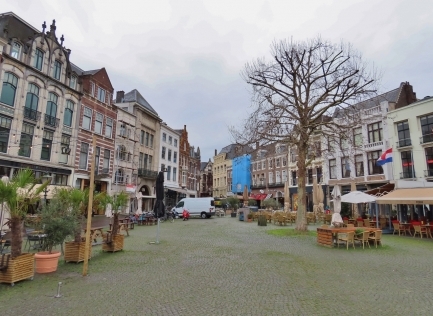 Many historical events took place at the square De Plaats, next to the former Gate Prison. 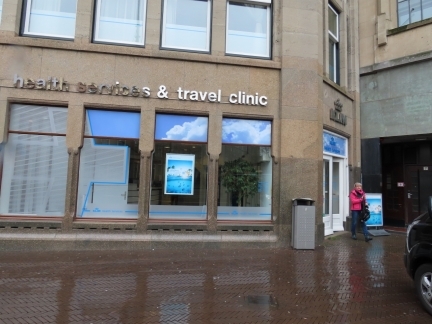 It now contains an appealing mixture of restaurants, bars and shops. 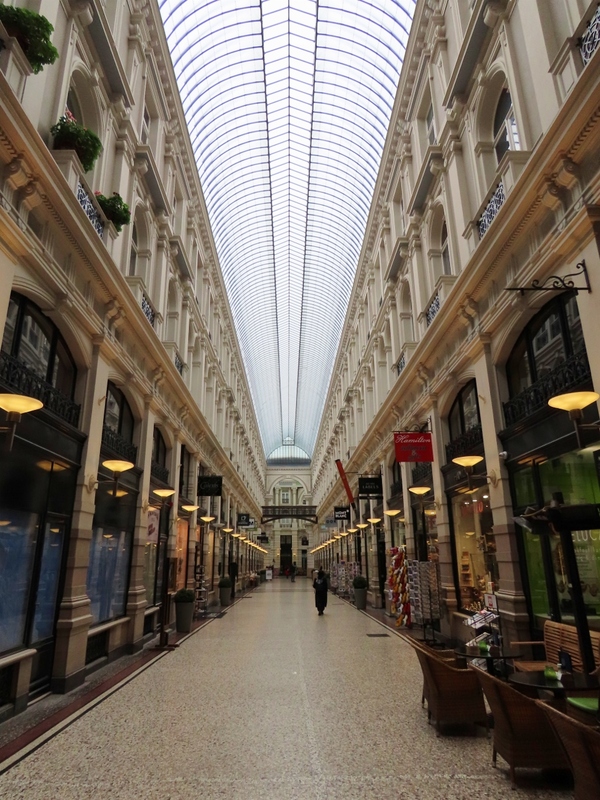 The light-filled De Passage Shopping Mall is the only remaining Netherlands example of this type of covered shopping street, popular in major European and America cities during the 19th century. Leadenhall Market is an example of one in London. 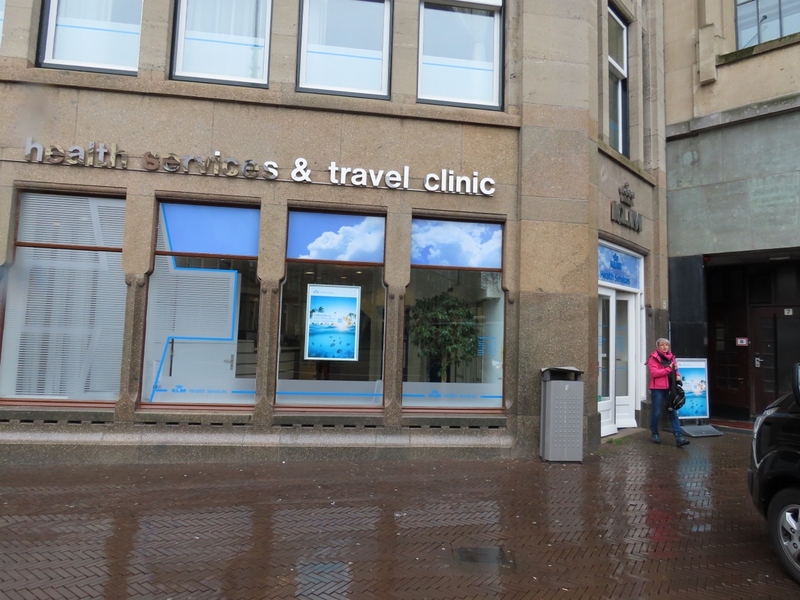 We planned to visit The Hague anyway, but while here made an appointment to have our second tick-borne encephalitis vaccination. 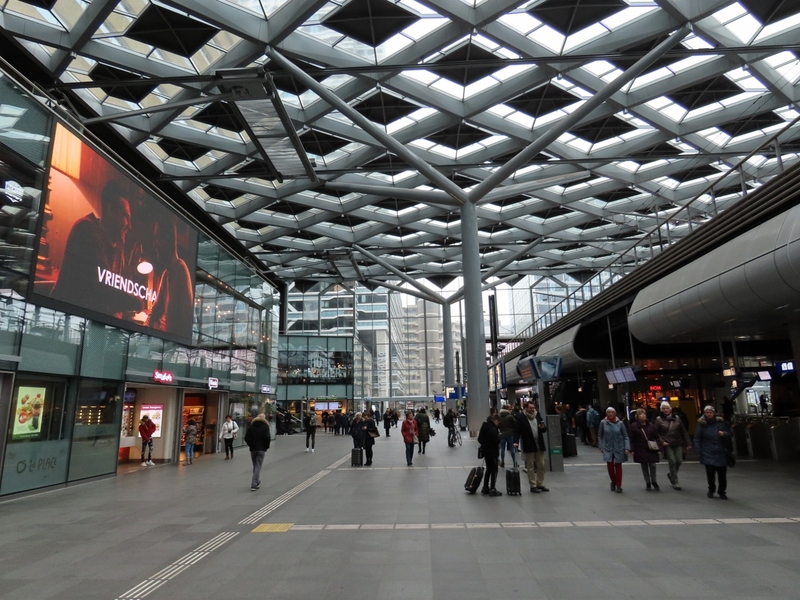 We’d had the first a month earlier at Schiphol Airport when we returned from Seattle. 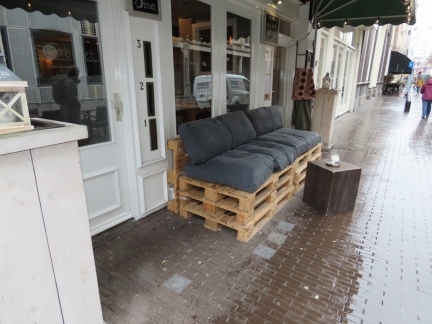 An outdoor seat made from shipping pallets. 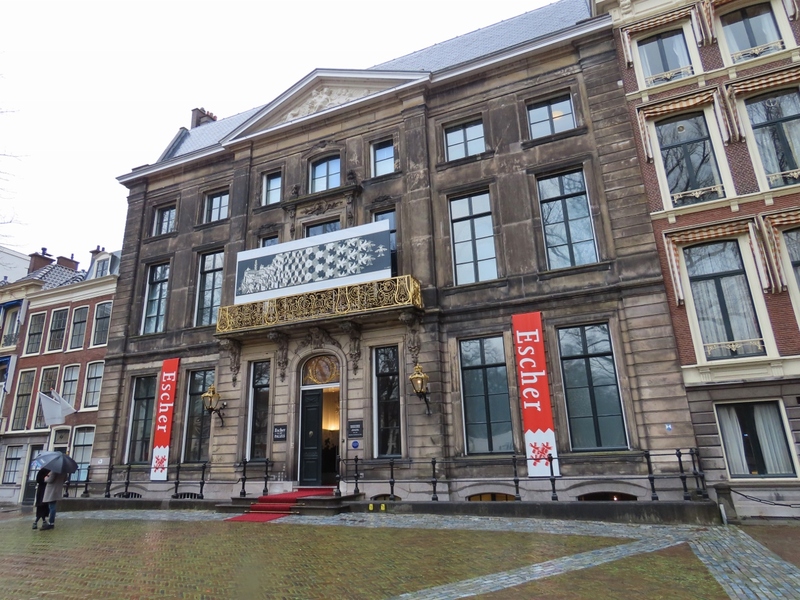 We spent much of the rest of the afternoon at a museum devoted to famous Dutch graphics artist Maurits Cornelis Escher whose work features mathematical objects and optical illusions. The museum is housed in an 18th-century building that was a royal palace for much of the 20th century. 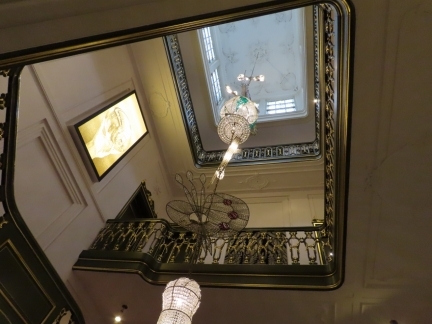 Looking up through the light-filled dramatic entrance to the Escher museum with its marvelous chandelier. 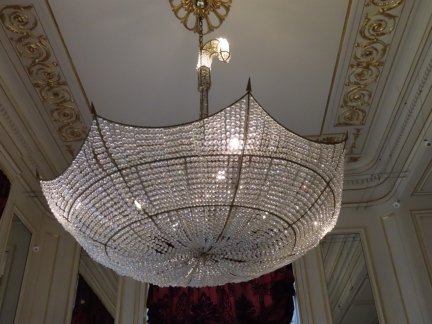 Dutch sculptor Hans van Bentem designed the spectacular and whimsical chandeliers for the royal palace, such as this one shaped like an umbrella. James has long had an interest in Escher’s work. 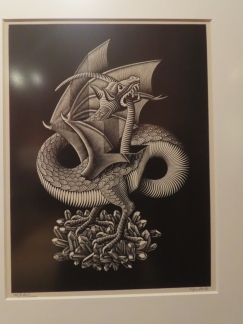 As a teenager he had a poster of Escher’s Dragon on his wall and as an adult very much enjoyed reading Douglas Hofstadter’s Godel, Escher, Bach that explores the common themes between the works of the mathematician, the artist and the composer. The beast in Dragon appears three-dimensional with its head biting its tail, both projecting through slits in the page that demonstrate its two-dimensional nature. 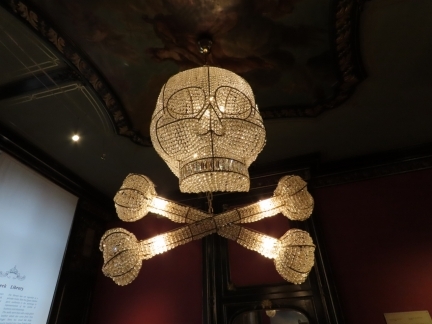 Another unusual royal palace chandelier, this one in the shape of a skull and crossbones. 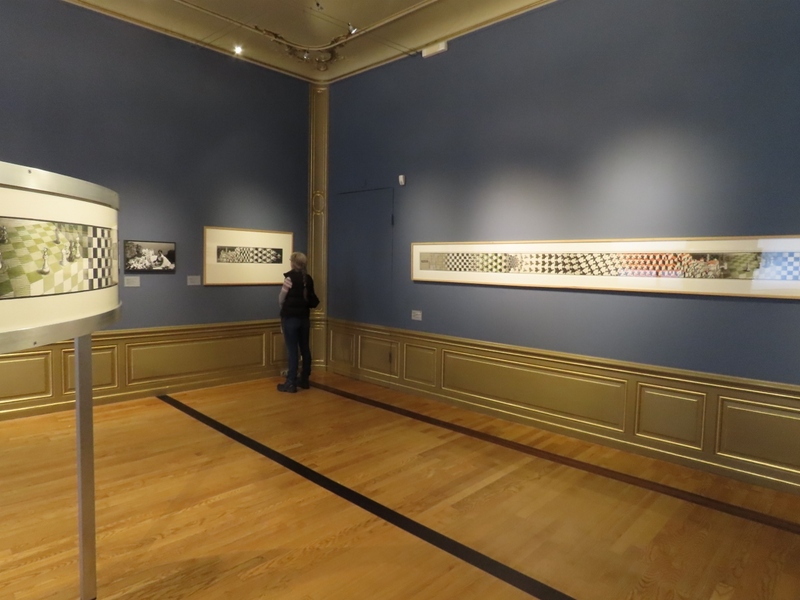 Escher’s three Metamorphoses, produced between 1937 and 1969, are displayed here together for the first time. Jennifer is viewing Metamorphosis I, the 4m-long Metamorphosis II is on the wall to the right and the 6.8m-long Metamorphosis III is partially visible on the left, displayed in the round. 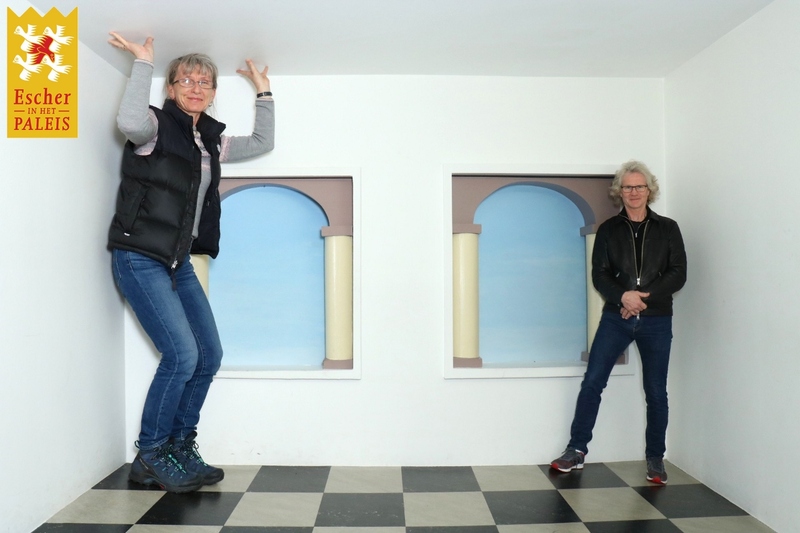 Jennifer has always wanted to be big and got her chance at the Escher Room in the museum. The room creates an optical illusion, where the floor and ceiling slope up towards where Jennifer is standing. 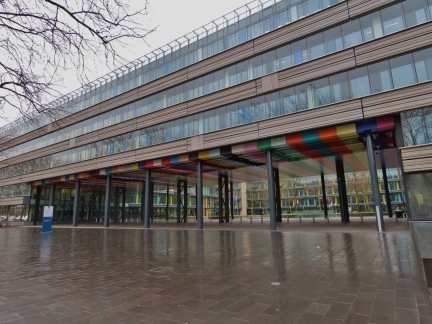 But our brain straightens the wall and ceiling, making anything on the left appear much larger. Even understanding the illusion we couldn’t force ourselves to see the room’s real shape. 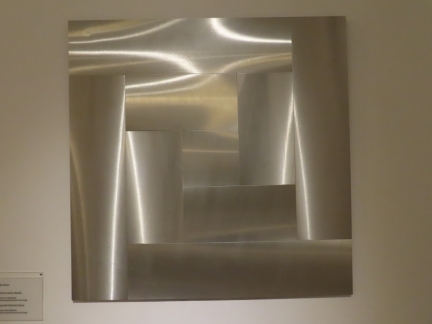 In Surface with Vibrating Texture, artist Getulio Alviani has burnished a flat aluminum surface such that it appears round and three-dimensional. 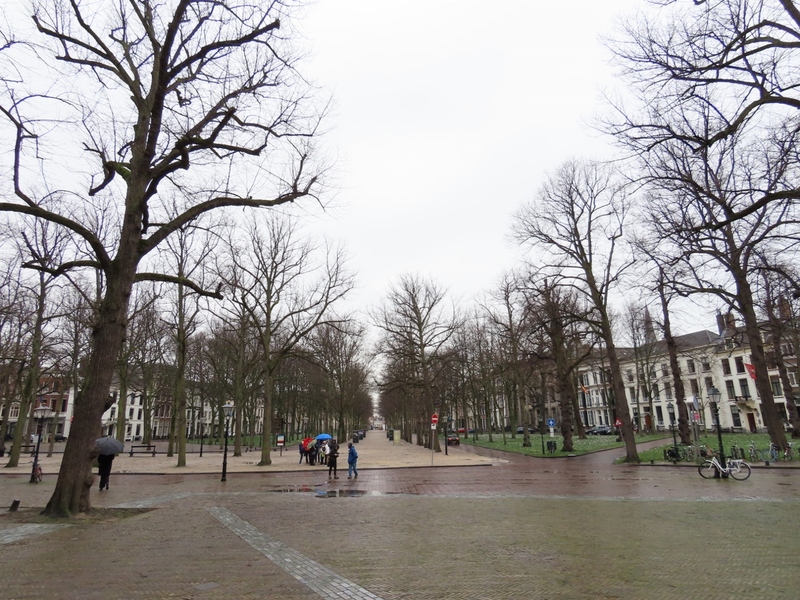 Looking west along stately Lange Voorhout outside the Escher museum. 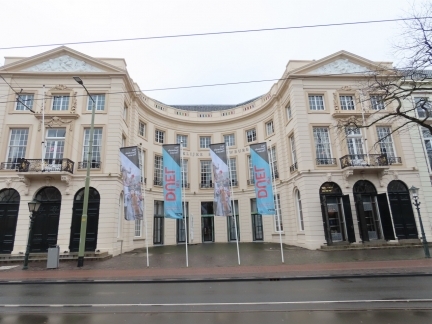 The Royal Theater in The Hague was originally built as a palace in the 18th century. The Dutch Ministry of Finance building in The Hague. 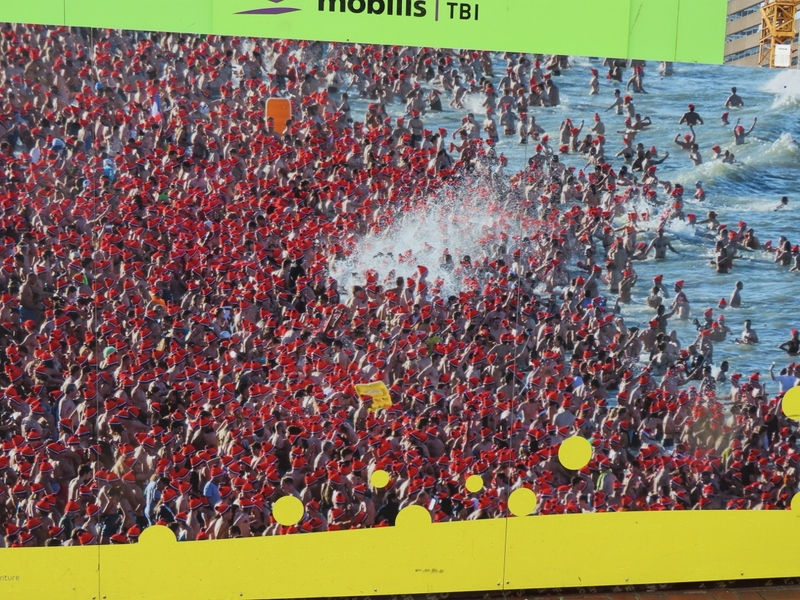 Poster in The Hague of a Nieuwjaarsduik (“New Year’s Dive”). 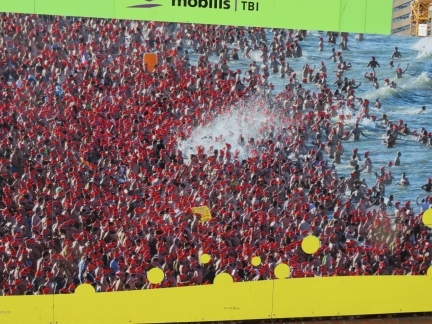 Over 15,000 people participate in 60 locations across the Netherlands, but the largest is at Scheveningen beach near The Hague, where over 10,000 people dive into the icy water each January. 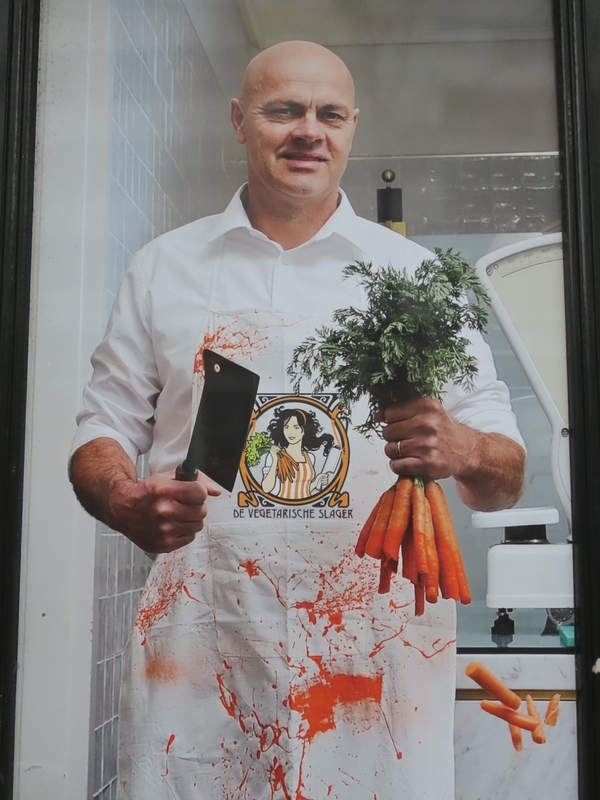 We loved this post of De Vegetarische Slager (“The Vegetarian Butcher”) on a street in The Hague. The Nieuwe Kerk in The Hague was completed in 1656, replacing the 14th-century Great Church that had become too small. 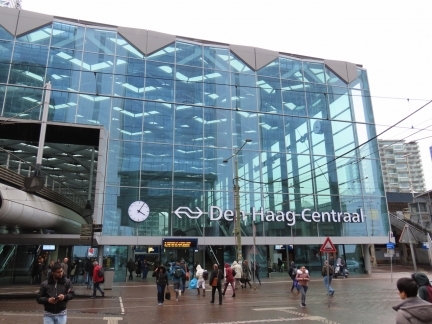 Back at modern Den Haag Centraal for our return trip to Amsterdam.